In a spoof of a spoof twist, a poster campaign in San Francisco is spoofing both the iPod Apple spoof campaign as well and the Got Milk campaign in an effort designed to make Americans question our government's democratic motives in relation to recent international events. Campaign creator and San Francisco novelist Robert Mailer Anderson explains, "It's not pro-Democrat, it's not pro-Republican -- it's supposed to make you think. Do these people in Iraq have democracy? 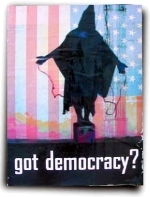 And do we have democracy? The Guantanamo Bay issue of suspending people's rights - - Americans and Iraqis -- smacks of McCarthyism, which is a kind of fascism. Billions of dollars are going toward (Iraq) and yet we don't have money for our schools and our homeless and we don't have a national health-care program? And a large part of the (Iraq) money goes to (Halliburton), which our vice president was formerly president of and is a large stockholder in? It seems like such an overt boondoggle. If (this) were any other country -- and use the criteria that Bush uses toward other countries -- we'd not be called a democracy now." There are 1,000 posters spread throughout the downtown and South-of-Market areas.